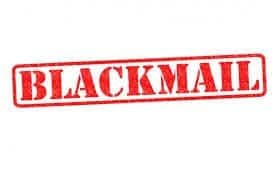 Blackmail and Extortion – the act of blackmail refers to demanding something from somebody, in return for not revealing information about that person which would damage their reputation. In other words, the act of threatening to reveal something about somebody unless they comply with your demands. Acts of this kind were previously dealt with under s100-105 of the Crimes Act 1900 (NSW) however these sections have been repealed. For this offence to be proved, the demand with menaces must be unwarranted. A demand will be unwarranted unless the person making the demand believes that he or she has reasonable grounds for making the demand and reasonably believes that the use of the menaces is a proper means of reinforcing the demand: s249L. Subsection 2 of section 249K also provides that a person is guilty of an offence against subsection (1) if the person accuses, or threatens to accuse that a person has committed a serious indictable offence. In other words, if a person accuses or threatens to accuse another person of a serious indictable offence with the same intention(s) as subsection (1), they will be guilty of blackmail. If found guilty of blackmail, a person may face up to 10 years in prison. Blackmail is a very serious criminal offence which is reflected in the penalty which may be imposed on a person if found guilty. With the advent of the internet and social media, a person may be more easily blackmailed due to sharing too much information or images, which they would not want the general public to see. In 2014 Paul Douglas Peters entered a home on the North Shore of Sydney and attached what police believed was a bomb to the neck of Madeleine Pulver, the daughter of wealthy businessman Bill Pulver. Peters also left a note demanding money. It is believed this was an attempt by Peters to extort money from the Pulvers. Extortion is also referred to as demanding property with menaces with intent to steal. This is an offence under s99 of the Crimes Act. The word ‘menaces’ refers to an express or implied threat of any action detrimental or unpleasant to another person, and also includes a general threat of detrimental or unpleasant action that is implied because the person making the unwarranted demand holds a public office. For this offence, it does not matter that the demand a person makes is not met or that the person who is demanded to do something is not influenced by the threat made. In order to prove that this offence has been committed, the Crown is required to prove that the person making the threat had the intention of stealing. If a person is found guilty of demanding property with menaces or by force with intent to steal, they will face up to 10 years in prison. If a person is found guilty of this offence and the offence is committed in the company of another person, they will face up to 14 years in prison. If the accused believes that they have a legal right to the property demanded this will constitute a defence to an offence under s99. The critical element, which must be proved beyond a reasonable doubt by the Crown in order for an accused person to be found guilty of this offence, is that the accused intended to steal. This cannot be proved if the accused believed the property was their own property or they had a legal right to that property, for example, they had entered into a contract with the alleged victim, had performed their obligations under the contract and were therefore entitled to the property. If this is the case, then an accused person cannot have an intention to steal. Blackmail and extortion are very serious criminal offences. If you have been charged with blackmail or demanding property with menaces with intent to steal, it is vital to speak to an expert criminal defence lawyer to be properly advised on your legal position, to know your rights and to know the best steps to take in any legal proceedings. If you have been charged with blackmail and extortion or demanding property with menaces with intent to steal, call George Sten & Co Criminal Lawyers. Our expert criminal defence lawyers will advise you on your legal rights and provide qualified advice on the next steps you should take. We are available 24 hours a day, 7 days a week and can be contacted on (02) 9261 8640 during business hours or 0412 423 569 outside of business hours. We may also be contacted via email at georgesten@criminal-lawyer.com.au.